I have a short mental list of homemade preserves that I try to make every single autumn. These are the things I rely on to ease wintertime cooking and baking and also to help connect me to the warmer months, which always feel so distant when there’s snow on the ground. This short list includes things like thick tomato sauce for adding to soup or using as pizza sauce, honey sweetened pear chutney to give life to simple lunches, and as much applesauce as I can manage. 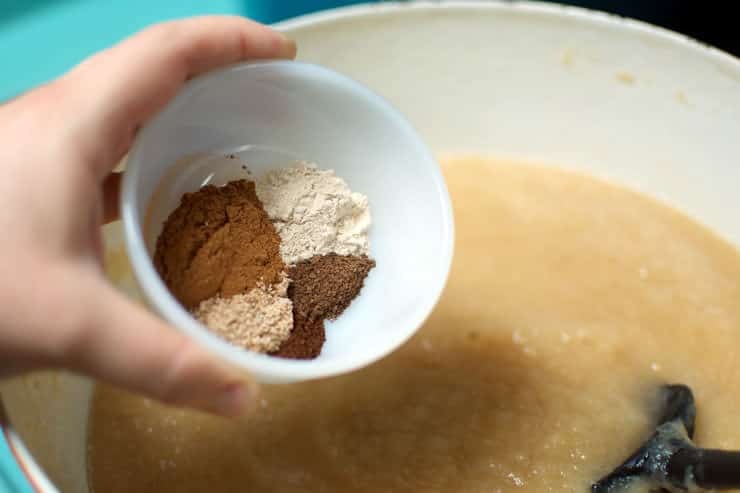 Often, applesauce gets dismissed as something best served to kids, but even in my child-free household, I find it’s one of my most-used pantry items. I use it to lend moisture to baked goods. I stir it into pots of oatmeal to give bulk and get a serving of fruit into the meal. I eat it for lunch with a scoop of cottage cheese. And of course, when Hanukkah rolls around, my cousins request that I bring a jar or two for topping the latkes. I’ve made applesauce a number of different ways over the years, and I’ve found that truly, there’s no wrong approach. You can peel and core your apples, cook them down in cubes, and crush them with a potato masher. 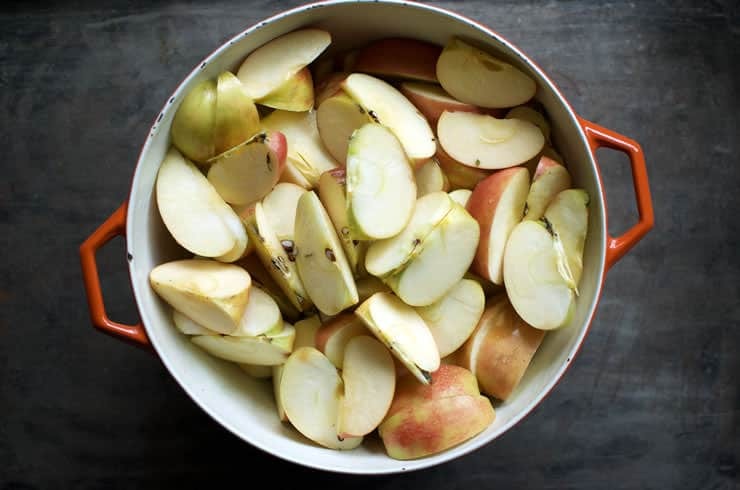 You can chop out the cores, heap the apples into an oven-safe pan, roast them until tender, and purée the softened skins in with the fruit. 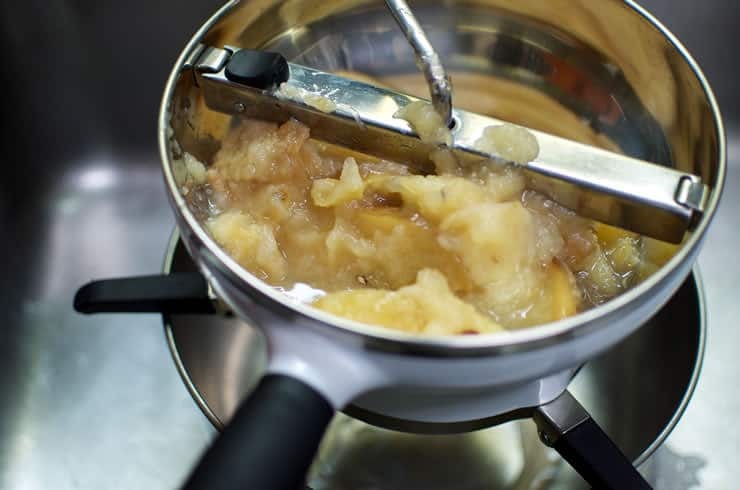 Or, if you have a food mill handy, you can roughly chop the apples—peels , cores and all—cook the fruit until soft, and then push it all through the food mill. It’s this last approach that is my favorite, in part because I find it to be the least amount of work for the very most amount of sauce. The food mill plucks out all the pesky seeds, cores, and skins, leaving you with nearly no waste and hint of pink from the skins, to boot. It’s this technique that I detail in the recipe below, though truly, you can follow the spicing and canning instructions no matter how you cooked your apples down into sauce. Don’t write this recipe off simply for lack of a food mill. Now, let us speak a moment about the spices. I’ve named this recipe Pumpkin Pie Spiced Applesauce because PPS has become shorthand for those warm, aromatic spices that we all love (or love to hate) this time of year. I’ve listed out the spices I want you to use, because it wouldn’t be in the spirit of October Unprocessed to tell you to head for the store to buy a container of premixed pie spice (though, if that’s all you have, a rounded tablespoon would serve perfectly). 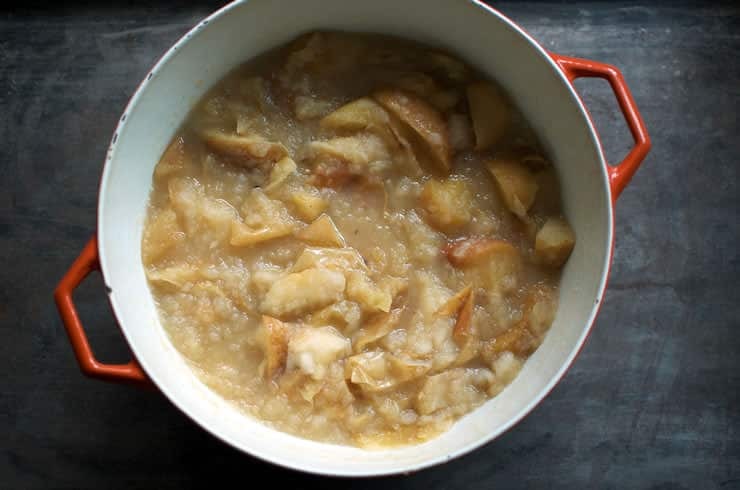 However trendy they may be, there’s no denying that adding spice to homemade applesauce elevates it beyond any grocery store version and makes a very convincing argument for going unprocessed. 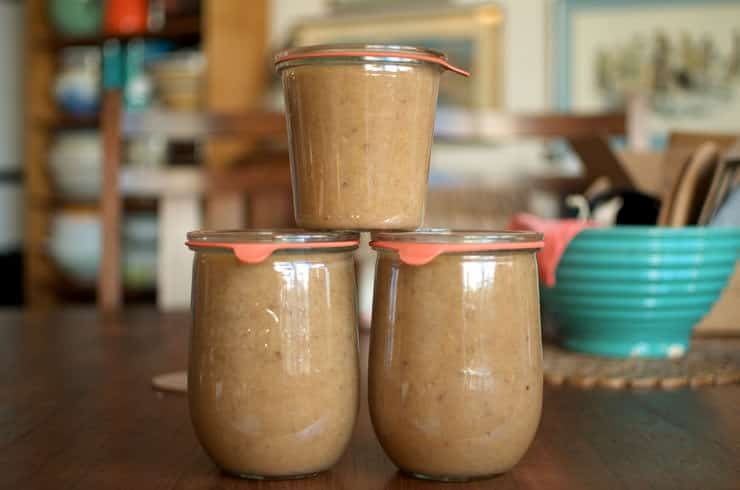 Often, applesauce gets dismissed as something best served to kids, but even in my child-free household, I find it’s one of my most-used pantry items. Chop the apples into 1/8's and heap them into a large, non-reactive pot with the water and cover. Set the pot on the stove over medium-high heat and bring it to a low simmer. 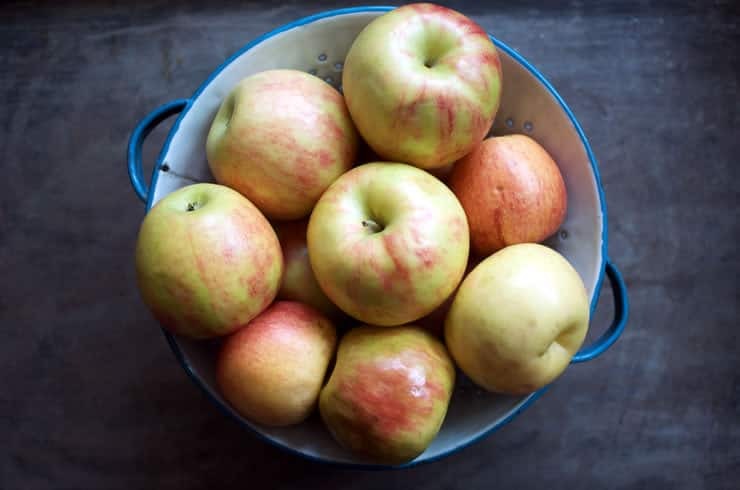 Let the apples cook for approximately 20 to 30 minutes, stirring occasionally, until the fruit is soft enough to crush with the back of a wooden spoon. Prepare a boiling water bath canner and enough jars to hold 10 cups of sauce (I used two liter sized Weck jars and one half liter jar, but a similar combination of pints and quarts would also work). Fit your food mill with a medium-sized screen and position it over a large mixing bowl. Work the cooked apples through the food mill until all the sauce is in the bowl and all you have left in the top of the food mill are dry skins and seeds. Spoon the applesauce into the prepared jars, leaving 1/2 inch headspace. Use a chopstick to ease out any trapped air pockets and add more sauce to return the headspace to the proper levels, if necessary. Wipe the rims, apply the seals, lids, and clips (or lids and rings, if you’re not using Weck jars), and process in a boiling water canner for 15 minutes (if you live above 1,000 feet in elevation, adjust your processing time accordingly). When the jars are cool enough to handle, test the jars to ensure they’ve sealed properly. Sealed jars can be stored in a cool, dark place for up to a year. 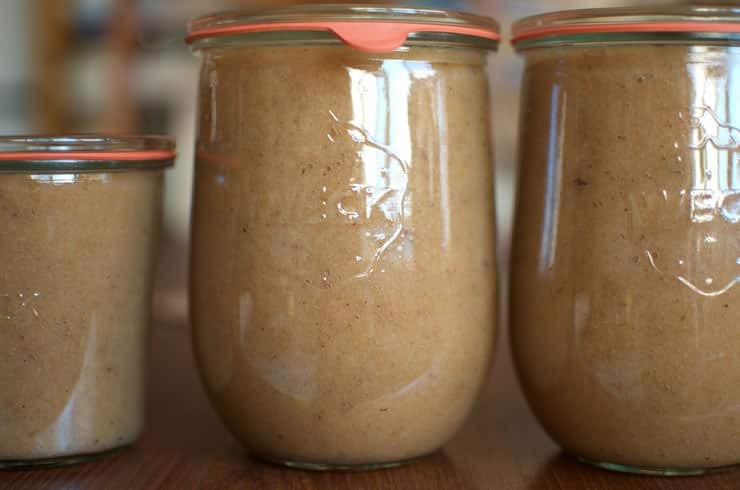 Unsealed jars should be refrigerated and eaten within two weeks. In most cases, people have come to think of this combination of spices as pumpkin pie spice, not apple pie spice. So it seemed to make sense to use that association to give people a quick understanding of what they’d be getting by using this recipe!